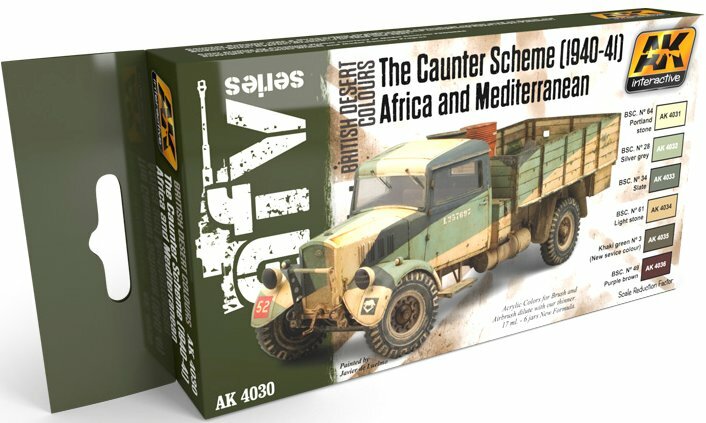 The Caunter Scheme 1940-41, is a set of six acrylic paints essential for painting British vehicles used in the Africa and Mediterranean campaigns of this period. These acrylic paints are formulated for both brush and airbrush use, and they are soluble in water, meaning that you won’t have odours as you would experience from the more aggressive, solvent-based paints. 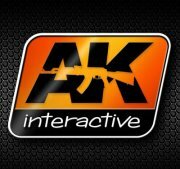 Our acrylics are manufactured by AK-Interactive, and are made from our own formula, which prevents problems with them drying in the airbrush, causing potential blockages. A profile guide is printed on the backside of the box. The faithful recreation of accumulated dust and dirt is one of the key factors of realistic weathering. This newly designed weathering set brings a brand new formula of specialized key ingredients, giving you the most common tones of accumulated dirt and dust. There is no longer a need to experiment and try to prepare your own mixtures in order to reproduce these effects, because we have found the answer for you. Our enamel paints can be applied straight from the bottle or diluted, onto the chosen areas of your model. Once they are dry, they have the same scale appearance as real dust and dirt. 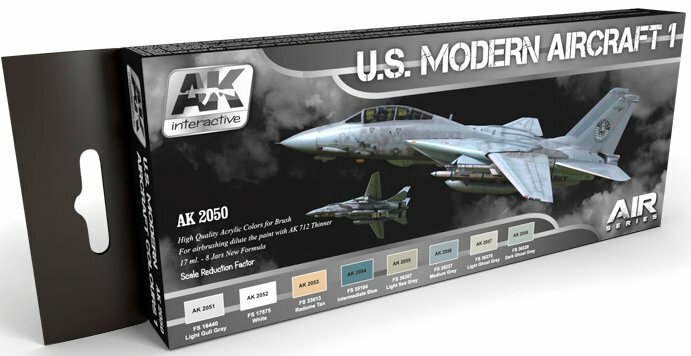 U.S. Modern Aircraft 1 is a set of 8 acrylic paints, essential for painting the authentic colours used by the U.S. Navy and USMC from the early 1970s, onwards. These colours can also be used to paint many modern USAF aircraft. Our new colours have been carefully researched for accuracy, and are presented in our familiar easy to use bottles. The acrylic paints are formulated for both brush and airbrush use, and they are also soluble in water, meaning that you won’t have odours as you would experience from the more aggressive, solvent-based paints. Our acrylics are manufactured by AK-Interactive, and are made from our own formula, which prevents problems with them drying in the airbrush, causing potential blockages. A profile guide is printed on the backside of the box. We recommend our thinner AK712 for best results. 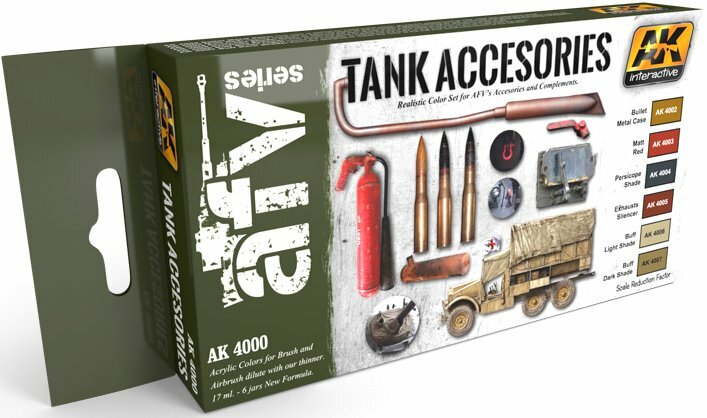 Tank Accessories is set of six new acrylic paints, including all the colours you need to paint equipment, ammunition and other accessories carried by combat vehicles. These acrylic paints are formulated for both brush and airbrush use, and they are soluble in water, meaning that you won’t have odours as you would experience from the more aggressive, solvent-based paints. Our acrylics are manufactured by AK-Interactive, and are made from our own formula, which prevents problems with them drying in the airbrush, causing potential blockages. We recommend our thinner AK712 for best results. A new high quality enamel product, developed for scale aircraft models, with an improved flow for easy creation of depth, and emphasis of surface detail. This product is perfectly suitable for aircraft models which are painted in a variety of base colours. All of these new sets along with all of AK Interactive’s other paint sets can be found at their website..